Today we had lunch at the Old Spaghetti Factory in Duarte, CA. Our first trip to this restaurant was the one in Salt Lake City, UT where Michael and I ate while we were up visiting his sister Heather and her then newborn son, Tanner. 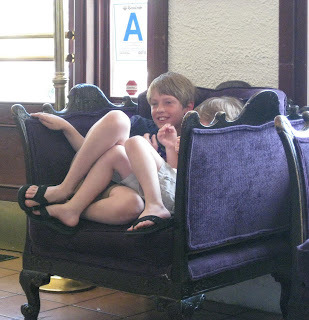 Tanner turned 14 this weekend, so it's been quite a few years since we had our first dining experience there! Of course, the draw of the Old Spaghetti factory is the buildings they occupy. They are generally old train stations with dark woods and high ceilings. And they all have a big trolley car right in the middle of the restaurant where all the kids want to sit. This was our first time at the one in Duarte; we passed it on the freeway a month ago and decided that the next chance we got, we'd try it out. 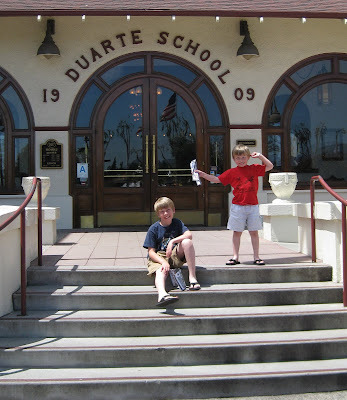 The Duarte restaurant is in an old school house. 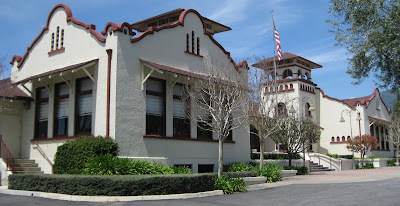 The exterior says the school was built in 1909, making it 100 years old. The boys were thrilled with the high arches that made up the doorways, so different from today's modular classrooms! The menu rarely changes in the 40 years since the original opened, but one thing has... the prices! It used to be such a good deal that we'd make the drive to the one in Fullerton (around 30 miles away) knowing we would get some good, cheap eats. Now it's not really worth forking over the money for both the gas and the food. Which is sad, because the spaghetti with Mizithra cheese and browned butter is delish (although it will instantly raise your cholesterol level by several points)!